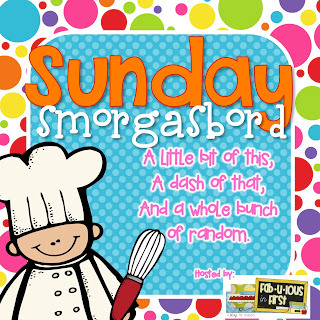 Here I am for a quick little Sunday Smorgasbord. I was thinking about what random school things I've been doing this past week and I immediately thought of Instagram. I've been posting my random thoughts and things that have happened on Instagram all week. I'm not sure if you have or haven't jumped on the Instagram bandwagon or not, but I am LOVIN' it --- kinda like McDonald's. It's just a fun way make some more connections to other teachers (and other non-teachers as well). You can click on each picture to go the original post on Instagram and read my posted comment as well other comments too! Something I'm working on right now! Back to school shopping already?!?!?! But who doesn't love Target? A little teacher handwriting link-up with Babbling Abby. So fun!!! My daughter wanted to link-up too! A little bit of crafting! I would highly recommend jumping on Instagram and following all your favorite people, teachers, bloggers, etc. It's a great place to find new ideas (kinda like Pinterest) and share pictures (a little like Facebook). If you want to see some of the Photo Apps I use, click HERE to go my original post about Instagram. Since that post I've added Beautiful Mess and it's my FAVE! Don't forget to head over to Fabulous in First to check out the other randomness!!! I love Instagram too...and A Beautiful Mess! Your Phonics "Ph"riends and Short Family packs look great!! Cute names!